I thought Akiba had snuck on here with a post when I saw our last headline was “Gabby. Work!” — like, look at her being up on the Olympics on our blog when I didn’t even know she was watching. Turns out, no, she was talking about a 2010 Elle cover of Gabby Sidibe, not the gymnast champion. Whatever the blog equivalent of cobwebs is, now’s the time to dust ours off and show small.medium.large a little bit of love. Speaking of Gabby, I refuse to talk about a child’s hair on the internet or even to discuss that people were discussing a child’s hair on the internet. Anyone raised with a smidge of sense knows better than that. Oprah, a child of the 60s from Mississippi who lived in Black Hair Capitals Baltimore and Chicago, knows that this is a real stretch of the word “natural.” Missing a date with the comb attachment on your blow dryer does not make your hair natural, it makes it un-blow dried. Oprah considered going for real natural with a close-cropped Camille Cosby look, but Bill told her she had the wrong-shaped head for all of that (mind your business, Bill, lest we start telling you that you have the wrong belly shape for all those tight sweaters). So instead we are left with this cover, where she looks more 80s crimped out than 70s Afro’d out. 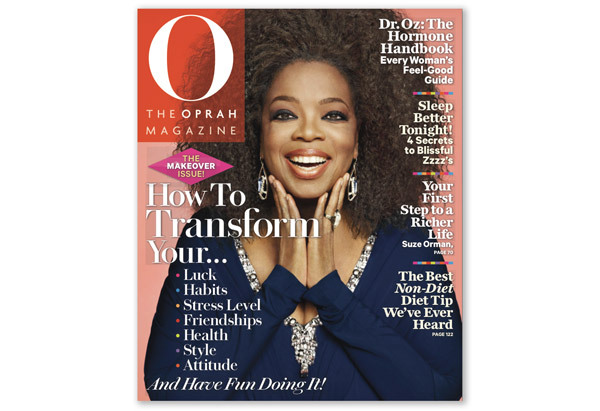 I suspect Oprah is enjoying this. She has been looking for hair accolades for as far back as when she was wearing those green contacts on her show. In the early 90s she told us she’d always wanted “hair that moves.” Then, in the early 2000s she was so happy to have it, she told Chris Rock to stick his fingers in her roots to prove it was all hers. Everyone cites Tom Cruise trampolining on that couch, but the Root Feel-Up was the ultimate inappropriate moment of her talk show run. On Friday I did a Black history month speech at my third-to-eighth grade alma mater, The Baldwin School. Back in the ’80s when I, my bigsis and a smattering of our Philly homies with high test scores and education-focused parents attended this all-girls, hoity toity institution, it was about 98 percent white. In 2009, I’m not sure of the breakdown but it’s pretty safe to say that it’s still very vanilla. For all of its educational prowess and good intentions, Baldwin was not a safe space for me. The race and class wounds are deep and sometimes unspeakable. They’re also old, tired. So I returned to the scene of the crime to talk to the Black girls mentoring organization about body image. Honestly, I was expecting a tiny, prematurely solemn group of youngsters burdened by Barbie dreams. Instead I witnessed what felt like a village wide dance in the rain after a multiyear drought. Imagine 15 little Black girls with hair popping out of ponytails and plaits, romping and squealing and spontaneously holding hands. Watch as a fellow presenter drapes the girls in headwraps and dashikis and they happily perform a scene from a play set in wartime Sierra Leone with adlibs and plenty of giggling. It’s so rare to see girls–or anyone for that matter–act totally unselfconscious about thier bodies and beings. When you do, it’s a blessing unparalleled.